S. Kinoshita, S. Yoshioka, and J. Miyazaki, Rep. Prog. Phys. 71, 076401 (2008). J. Sun, B. Bhushan, and J. Tong, RSC Adv. 3, 14862 (2013). S. Kinoshita and S. Yoshioka, Chem. Phys. Chem. 6, 1442 (2005). T. M. Trzeciak and P. Vukusic, Phys. Rev. E 80, 061908 (2009). J. W. Galusha, L. R. Richey, J. S. Gardner, J. N. Cha, and M. H. Bartl, Phys. Rev. E 77, 050904 (2008). L. Biró, K. Kertész, Z. Vértesy, G. Márk, Z. Bálint, V. Lousse, and J.-P. Vigneron, Mater. Sci. Eng. C 27, 941 (2007). 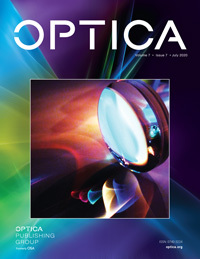 C. Q. Cook and A. Amir, Optica 3, 1436 (2016). H. Noh, S. F. Liew, V. Saranathan, S. G. Mochrie, R. O. Prum, E. R. Dufresne, and H. Cao, Adv. Mater. 22, 2871 (2010). R. O. Prum, R. H. Torres, S. Williamson, and J. Dyck, Nature 396, 28 (1998). P. Vukusic, J. Sambles, and C. Lawrence, Nature 404, 457 (2000). A. R. Parker and H. E. Townley, Nat. Nanotechnol. 2, 347 (2007). K. Chung, S. Yu, C. J. Heo, J. W. Shim, S. M. Yang, M. G. Han, H. S. Lee, Y. Jin, S. Y. Lee, and N. Park, Adv. Mater. 24, 2375 (2012). J. D. Forster, H. Noh, S. F. Liew, V. Saranathan, C. F. Schreck, L. Yang, J. G. Park, R. O. Prum, S. G. Mochrie, and C. S. O’Hern, Adv. Mater. 22, 2939 (2010). A. Finnemore, P. Cunha, T. Shean, S. Vignolini, S. Guldin, M. Oyen, and U. Steiner, Nat. Commun. 3, 966 (2012). M. Kolle, P. M. Salgard-Cunha, M. R. Scherer, F. Huang, P. Vukusic, S. Mahajan, J. J. Baumberg, and U. Steiner, Nat. Nanotechnol. 5, 511 (2010). J. Zi, X. Yu, Y. Li, X. Hu, C. Xu, X. Wang, X. Liu, and R. Fu, Proc. Natl. Acad. Sci. USA 100, 12576 (2003). J. P. Vigneron, J.-F. Colomer, M. Rassart, A. L. Ingram, and V. Lousse, Phys. Rev. E 73, 021914 (2006). C. M. Eliason and M. D. Shawkey, J. R. Soc. Interface 9, 2279 (2012). Y. Li, Z. Lu, H. Yin, X. Yu, X. Liu, and J. Zi, Phys. Rev. E 72, 010902 (2005). M. Land, Prog. Biophys. Molec. Biol. 24, 75 (1972). D. G. Stavenga, H. L. Leertouwer, D. C. Osorio, and B. D. Wilts, Light: Sci. Appl. 4, e243 (2015). E. Lee, H. Lee, J. Kimura, and S. Sugita, J. Vet. Med. Sci. 72, 1047 (2010). M. Kolle, A. Lethbridge, M. Kreysing, J. J. Baumberg, J. Aizenberg, and P. Vukusic, Adv. Mater. 25, 2239 (2013). P. Lalanne, Appl. Opt. 35, 5369 (1996). D. Brink and N. Van Der Berg, J. Phys. D 37, 813 (2004). C.-C. Lee, S.-F. Liao, and P. Vukusic, J. R. Soc. Interface 12, 20141354 (2015). Fig. 1. Structural colors in the black-billed magpie feather. (a) Photograph of a black-billed magpie feather showing a gradual color variation. (b) Magnified images of three different areas of the feather that exhibit colors of yellow-green (left), violet (center), and navy blue (right). (c) Reflectance spectra measured for the three sections. (d–e) Cross-sectional TEM images of barbules obtained from the three areas (presented in different magnifications). Fig. 2. Fabrication of artificial barbules. (a) Schematics of fabrication steps. PVA and PMMA stand for polyvinyl alcohol and poly-methyl-methacrylate, respectively. (b) SEM image of a one-dimensional photoresist grating generated by the LIL process. (c) Cross-sectional SEM image of an artificial barbule. (d) Photograph of three artificial barbules that exhibit red, green, and blue colors. Fig. 3. Reflectance spectra of artificial barbules. (a) Reflectance spectra measured (red) for a fabricated artificial barbule and simulated for realistic (blue) and simplified (black) model structures. Inset shows an optical micrograph of a fabricated artificial barbule. (b) Schematic of the two simulation model structures: the realistic one composed of multiple stacks of surface grating film (left) and the simplified one with effective medium layers for surface gratings. (c) Simulated reflectance spectra for the realistic model structure with different numbers of stacked layers. (d) Simulated reflectance spectra for various extinction coefficients of the composing film material. Fig. 4. Variation in structural color. (a) Calculated reflectance spectra as a function of polymer layer thickness. (b) Photographs of artificial barbules prepared at different polymer spin-coating speeds: 4000, 3500, 3000, and 2500 rpm. (c) Measured reflectance spectra for the artificial barbules shown in (b).